These are a few line maps in a series of experiments I’ve conducted. 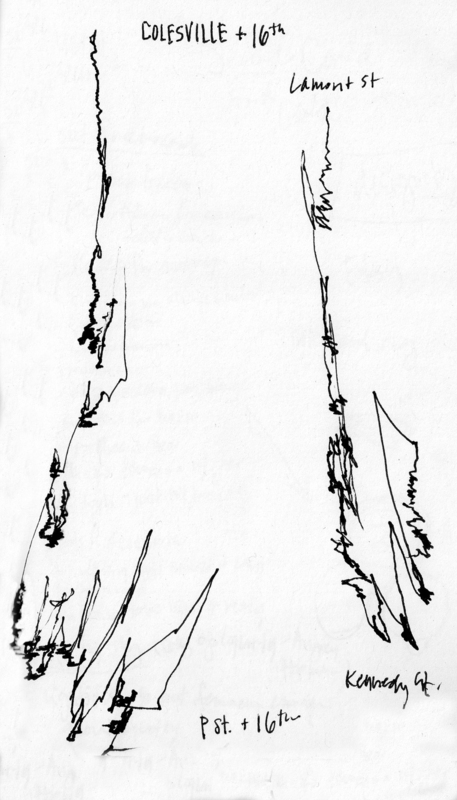 It’s a visual representation of my body’s movement – dictated in a single line. It’s something to pass the time, and patterns are fun to analyze. This particular bus route is completely straight, but it doesnt appear that way! While drawing I don’t look at the drawing, and I make sure to lock my wrist and my elbow. One fellow passenger thought I was a transportation analyst or a reporter. I suppose I could be! In response to Daniel’s comment > The original concept or driver was the fact that I was spending so much time riding public transportation and feeling rather unproductive. On one such ride, I was trying to write, and, like all experiences writing in moving vehicles, it was all over the place and not legible, so I decided to just play into it. Locking my elbow and wrist as I sat, letting the motion of the bus or metro guide my pen, looking away and out the window as normal, not focusing on the drawing as it was produced. I learned to keep a certain amount of looseness in my hand to let the pen go where the road or the tracks led the bus or train car. I wanted to look for patterns and trends, and some you could see, but there are so many factors, even when I rode the same routes at nearly the same time, so many traffic and people conditions existed. It was really great seeing the differences between cities (DC, NYC, SF, Bar Harbor, ME) and the BART vs. CAL train vs. the Subway… I’ll post these examples soon.